Here's another "platter". I included it because I like the image so much; the bigger one is doubtless too large for "blog jewelry" purposes. Here's the smaller image I made from it. And I have this image as well, which is a bit different from the one above. Here's another image which really is much better at a larger size. there are a lot of details that just do not show up here. I was trying to get a sort of papier mache effect with this one. I thought this was a pretty image, though very simple. I like the dark sapphire blues with white and gold. 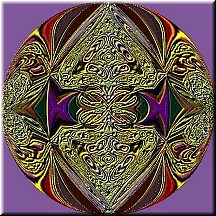 I made several images in these colors. I liked the colors of this rather dishlike "glass image" so much that I used it for more than one image. The "dish" images are pretty but perhaps not so adaptable to my purpose here. They look...like dishes. But here is a pretty bit of blog jewelry using the same pattern. Chiffon box (in honor of Mom). Very much the colors my mother loves best. Here's the same image in paler colors. I couldn't decide which I preferred. I liked this little image so much that I ended up making a number of variations. I like the mix of colors. 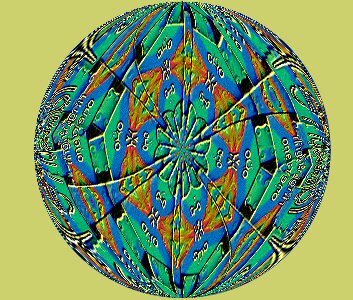 This is ANOTHER image that looks much more interesting at a larger size than is practicable for a blog ornament. It's a shame. I would love a necklace made from very elaborate beads like this, with lots of gold and burgundy. I am someone who leans toward the lavish; I definitely am not of the "less is more" school. But I can't indulge my love of lavishess so much when I make images to use in my blog. Here is the same image reduced to blog size. You can see the problem. I see this image as "jewelry" obviously, as opposed to some other type of object. Hey, it's all about imagination, right?